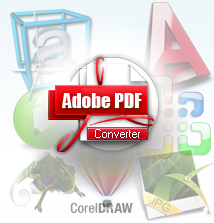 ﻿Adobe PDF Converter (Download)- PDF Converter, Word to PDF Converter, AutoCAD to PDF Converter, Excel to PDF Converter, PowerPoint to PDF Converter, CorelDraw to PDF Converter, WordPerfect to PDF Converter, RTF to PDF Converter, Txt to PDF Converter, Image to PDF Converter. How to register and obtain the latest version? How can I upgrade my Abdio products? I am a registered user, how can I get the latest upgrade information? I paid for the registration. Now, 24 hours later, I still haven`t received my registration code. Why? Is it necessary to buy the CD? If I haven`t receive the CD which I paid, what should I do? After more than one day I still haven`t get my reg information, what should I do? What are the Abdio refund policy? A. After you have purchased our product, we will send the registration Email to you which includes the registration information and the download address for the full version. After downloading the full version program, please save it into the installation directory and run it to replace the original trial version one. Please run the main program again,in the registration window and enter into the registration information, and then you are the registered user. A:1.If you are registered user, please download a Full Installation Package from the Download page, then re-install it again. 2.For trial versions, please download the upgrade package (an Exe or Zip package), and install it within your existing folder. This overwrites the original files of the same name. We'll send you the upgrade information without charge within 24 hours. 1:Please make sure you have received an email(RegNow or Paypal) with confirmation that your order has been authorized. After your order being authorized, your information will be added into our customer database. 2:We will sent within 12 hours register information for you. A: No, you needn't. Buying CD is just a option RegNow offered and sold. In any case, you can get your reg info after you paid. A: The price shown on our site isn't beside the CD. The CD is sold by RegNow. You should inquire RegNow to get the CD. A: You should check your inboxes which you may use to receive mails. Another possibility is your e-mail couldn't receive our mail because of the unknown server problems. Please tell us another e-mail address you have. A: At Abdio we suggest that you take advantage of our free trial software downloads and visit the product pages of our website to get comprehensive product information. What's more, we encourage you to make the best decision on purchasing. If you need to return an Abdio product, you must make your request within 30 days of purchase. Meanwhile, Abdio reserves the right to refuse any unreasonable refund. Therefore, you should explain what the problem is and the reason you want to refund in details, including your full order information. You have to uninstall all downloaded files and the refunded products can't be copied or saved in any other way after refunding. Your order information will be deleted from our database and the corresponding services will be cancelled.